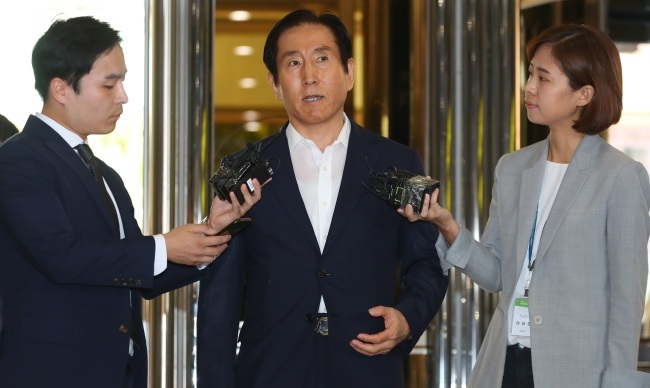 Former National Police Agency Commissioner-General Cho Hyun-oh was questioned by police Wednesday on allegations that he masterminded an online opinion-rigging operation carried out by police during the Lee Myung-bak administration. Cho denied the allegations upon his arrival at the central police headquarters in Seoul at 9 a.m. Authorities believe that from 2010 to 2012, Cho abused his power as National Police Agency commissioner-general by orchestrating online police activities to sway public opinion in favor of Lee, who was in office from 2008 to 2013. These alleged activities included posting some 40,000 comments supportive of the Lee government. Many police officers are suspected of having used the user names of friends and family members to post online comments, thereby misrepresenting themselves as ordinary members of the public. Cho is also suspected of having abused his power as the Gyeonggi Provincial Police Agency chief by launching an “internet response team” within the police agency in 2009 to conduct similar online activities in response to protests by SsangYong Motors’ laid-off workers. Their aim, allegedly, was to foment public opinion critical of the protesters. On Wednesday, Cho refused to accept the recent conclusion from the special police investigation team, which declared that the 2009 police crackdown on SsangYong Motors’ laid-off workers, conducted under Cho’s leadership, was a form of state violence. The special team recommended that the government apologize to the protesters and ensure that no similar events ever take place again. When asked about the matter, Cho said he could not accept the team’s recommendations and called the report “severely biased.” He has always tried to maintain political neutrality, he added. Arrest warrants have been denied for three former ranking police officers suspected of deep involvement in the online opinion-rigging operations.